There are few names that cause a hush to fall over a group of long-time Cardinal fans the way this one does. Eyes glaze over momentarily. Conversation comes to a pause. Thoughts turn to memories of that day. Eventually someone murmurs that they never would have seen it coming. June 22, 2002. The Cardinals were in Chicago to play the Cubs in a matchup of division rivals. As gametime approached, the stadium was buzzing with confusion. Warmups were not going as planned. Whispers throughout the stadium wondered what was happening. Then, a microphone appeared. Various members of the Cubs took the field. The Cubs’ players association representative, Joe Girardi, walked solemnly to the mic with tears in his eyes. Players left the field. Fans quietly filed out of the stadium. No one knew what had truly happened. No one could understand. Slowly news spread. Even slower came reasons. The answers never came for the question on everyone’s mind. In 1987 the Houston Astros selected Darryl Kile in the 30th round. While obviously a low-end pick, Kile nevertheless fought his way up the ranks, breaking into the majors in early 1991. During his first career start he had a no-hitter through six innings before being pulled. His career in Houston was bright, making his first All-Star team in 1993 and pitching a no-hitter against the Mets in September of the same year. A few years later in 1997 Kile went 19-7, again making the All-Star team, and making the postseason with the Astros. After that ’97 postseason appearance, Kile signed as a free agent with the Colorado Rockies. As many pitchers found out, pitches in Colorado don’t do the same things they do in other parks (pre-humidor, that is). Kile’s pitching suffered dramatically, and his two years in Colorado produced ERA’s of 5.20 and 6.61. His career was spiraling, until he was traded to the Cardinals. As one of many that felt the apparent healing powers of pitching coach Dave Duncan, Kile’s career felt a resurgence wearing the birds on the bat. In 2000, his first year in St. Louis, Kile was the first 20 game winner for the Cardinals since John Tudor and Joaquin Andujar in 1985. Over the next few years he emerged as the team ace, shepherding several of the younger Cardinal pitchers and being a strong leader both on the field and in the clubhouse. Darryl’s wife Flynn, twins Sierra and Kannon, and youngest Ryker, were all fixtures at the ballpark, from Family Day on the field to a little catch pregame in the clubhouse with father and son. His family was important to him, and they were held in high esteem by the Cardinals community. The Kile’s were close friends with Matt Morris and his family, among others. 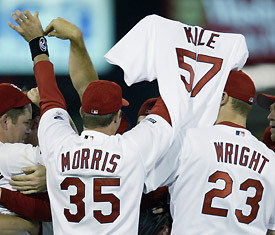 On June 18, 2002, Darryl Kile strode off the mound in Busch Stadium to a standing ovation. He had pitched 8 strong innings, giving up only one run against the Anaheim Angels. The Cardinals won the game 7-2, and with that win, took over sole possession of first place in the National League Central. Sadly for the Cardinals, the joy of victory was short in lasting, as news spread that night about Hall of Fame broadcaster and longtime voice of the Cardinals Jack Buck’s passing away. The team all wore patches for the rest of the season bearing the initials JFB (as seen on Kile’s sleeve in the above picture). It was a great victory for the team, a sad loss for Cardinal Nation, and the last victory of Darryl Kile’s career. Four days later, Kile did not show up to Wrigley Field on time for the day’s game. Teammates began to wonder. Messages were sent. Calls were made. The news finally broke – Darryl Kile had passed away in his sleep of a heart attack. The game that Girardi had tearfully informed the Wrigley faithful about being cancelled was made up over two months later, on August 31. Jason Simontacchi was the starter, and looked visibly emotional throughout the game. Kile had been a teammate, a supporter, and a friend. The team added a second patch to their jerseys, and a matching symbol on the wall in the bullpen of Busch Stadium. The Cardinals seemed to be a team of destiny. They overcame so much, dealt with emotional trauma, and yet responded with resiliency. After their fallen ace pitched them into first place, they never looked back, and the team finished as the winners of the Central Division. As the team ran onto the field to celebrate their division clinching win, rookie outfielder and third baseman Albert Pujols grabbed a hanger from inside the dugout to take with him into the celebration. He eventually handed it off to teammate and best friend of Kile, Matt Morris. Kile’s jersey never left the dugout throughout the rest of 2002, and his locker remained untouched for years. The Cardinals did not want to forget their teammate and friend. His fans never will. To find my memories of this story, head over to Diamond Diaries. Angela Weinhold is an executive editor and covers the Cardinals for i70baseball.com. She also writes writes for her own site Cardinal Diamond Diaries. You may follow her on Twitter here or follow Cardinal Diamond Diaries here. I was at Wrigley, sitting 3 rows behind the cubs dugout when Girardi made the announcement, but I already knew as an usher had informed our section about what had happened to DK just moments before. Your article brought back many of the emotions I had that season from June 18th on. I was also at the last game DK ever pitched and I remember seeing him walk off the field and without looking up, wave to the crowd that was standing for him. He was a special person. Thank you for remembering him with such a great piece. Thanks for sharing Kelli! I can’t imagine what it would have been like to be at either of those games. He was definitely a special person to have on the Cardinals, and he was gone far too soon. Beautiful post, Angela. I remember coming home from work that day and learning about Kile’s death. 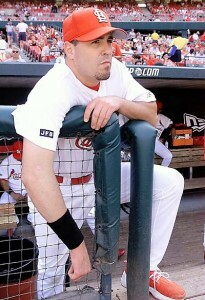 I wasn’t a Cardinals fan and had no attachment to Darryl Kile, but I remember turning the TV off and crying. I was 22 and probably hadn’t cried in years, but all of a sudden, my favorite pastime didn’t make sense. Baseball was supposed to be about homers and strikeouts and green grass and slick catches, not about tragedy and mortality. And then Darryl Kile was gone, designated for assignment in another world. And baseball went on, but it wasn’t the same. Thanks Bryan. It hit everyone in baseball harder than some thought it would. He was a wonderful individual, and did a lot for his team both on and off the field. Baseball was not the same without him. wow ! This story is so touching. I am not a baseball fan either but I was so moved by this story. I dont know Mr. Kile but any loss of life affects so many people. Apparently he touched many lives in so many ways imaginable. Im certain hes being instrumental wherever he may be up above. Hope to meet up with you one day at the pearly gates Darryl. Theres always something we can learn from another human being. Its even more awesome when this person, whom you dont even know leaves a lingering affect on your soul. Today , I know Darryl Kile much better than yesterday, and im so glad he touched my heart as well. God bless your family and friends Mr. Kile. hey i was wondering do you have the video clip of Girardi making the announcement? I wanted it for helping someone I know with grief. It was VERY touching. Thanks!! !